Summon: Transform an enemy creature with 2 power or less into a Sweet Roll. Grisly Gourmet is a rare Willpower creature card. It is part of the Heroes of Skyrim expansion. In addition to the card's availability in the Heroes of Skyrim expansion, two copies are included in the Ancano's Cunning theme deck. "I will prepare something special for them!" "You're so sweet I can just eat you up." 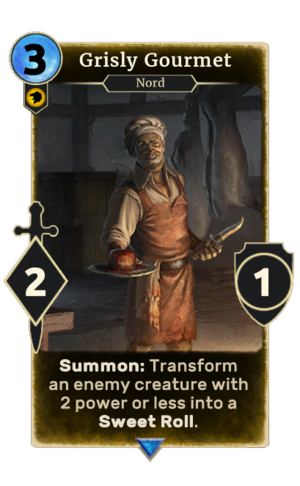 This card is based upon the quest in Skyrim where the player, a Dark Brotherhood assassin, poses as a famous chef called "The Gourmet". This card's summon ability applies the Tasty Treat card effect. For the 14th, 15th, and 16th login rewards in February 2018, one alternate art copy of the card was awarded. It is themed for Heart's Day, the Tamrielic equivalent to Valentine's Day. The alternate art version of the card also creates similarly-themed alternate art Sweet Rolls. This page was last modified on 10 March 2019, at 10:55.